Energy companies will be required to let customers know what their best deal is, in a move which ministers say could save households up to £100 a year. Firms will be obliged to tell people about the most suitable tariff for them and to offer it if they request it. Announcing the move, Deputy PM Nick Clegg said seven out of 10 people have the wrong deal and pay too much. 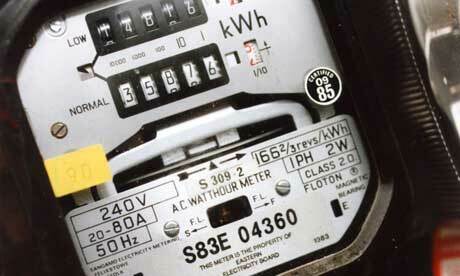 Labour have accused energy firms of "ripping off" people and said there must be more competition in the market. Under the deal, British Gas, E.On, NPower, Scottish and Southern Energy, EDF and Scottish Power will contact their customers once a year to tell them what the best tariff is for them, and how to get it. They will also contact customers coming to the end of a fixed-term contract with the same advice. They will not be obliged to let people know about cheaper deals with rival companies. But the government says it is looking at the possibility of putting "quick read" codes (like barcodes) on energy bills by spring 2013, containing information about someone's energy consumption, which they could then share with other energy firms to see if they could offer a cheaper deal. Most customers saw increases of between 15% and 18% in their gas bills in the autumn, while electricity bills also rose sharply, a move energy firms blamed on rising wholesale energy costs. Leading firms cut their prices earlier this year - reflecting what they said was a dip in commodity prices and the mild winter - but not by enough to compensate for the earlier rise. Environmental campaigners say the deal announced on Wednesday was just "tinkering around the fringes". 'A bit confusing' But Mr Clegg told the BBC it was "an important step" as companies were currently under no obligation to tell customers whether they were on the wrong tariff and few people would "turn their noses up" at a £100 saving a year. He said it was part of a series of measures the government was looking at, aimed at driving bills down, but admitted he had not personally switched energy providers for some time. He told BBC Radio 5live: "We haven't switched actually over the last year or two and I kind of think we're probably very typical. You stick to a tariff, you think it's all a bit complex, you get lots of stuff through the letterbox... all a bit confusing. You don't really then make the effort or take the time to look at how you're using your energy and what tariff would be best for you." He said he hoped that from this autumn all the information would be much simpler and it would be much easier for people to work out the best tariff for them. Consumer Focus said the move was a "welcome first step", as customers coming to the end of a fixed-term contract would be able to move on to the cheapest deal rather than the more expensive standard rate. But the organisation's director of energy Audrey Gallacher added: "This is probably only going to work if this is part of a much wider strategy to really help people engage more effectively with their energy bills, really cut their costs and get the best out of the energy market." 'Fiddling at the margins' Labour have called for the cheapest tariffs to be guaranteed for the over-75s and said firms should be forced to sell energy to new providers, such as retailers, to open up the market. "Six months ago, at the energy summit, Labour called on the government to get tough with the energy giants - but all ministers could do was get the energy companies to write to their customers telling them to shop around," said shadow energy secretary Caroline Flint. "Our energy market needs a complete overhaul, but this government is only fiddling at the margins." Greenpeace said any move to bring down bills was "good news" for thousands of households but the government needed to do more to reform the industry, making Britain less dependent on expensive imported gas and backing "home-grown renewable energy". "It is good to see Nick Clegg taking an interest in the plight of people who are feeling the pinch," said the pressure group's head of energy, Jim Footner. "But tinkering around the fringes of the overly gas-dependent energy sector simply won't be enough." Christine McGourty from Energy UK, which represents energy companies, said consumers needed to shop around to get the best deal. She added: "There are many different ways people can manage their energy bills, whether by changing tariff, method of payment or installing energy saving measures such as insulation." Energy regulator Ofgem has accused the largest six firms of having a "stranglehold" on the market but they say competition is the strongest in Europe. The DRU app, as easy as 1, 2, 3(D)!